This blog previews and discusses one of the top priorities for Africa in 2016 as shown in Foresight Africa 2016.
which covers other critical issues affecting the continent. You can also watch video or listen to audio from our annual Foresight Africa event. Western media has been under scrutiny for its coverage of the African subcontinent, as often it seems to cover mostly negative trends or times of crisis. This tendency is unfortunate: A strong media that accurately covers events in a timely fashion can reduce information asymmetries; biased or partial coverage can, however, distort perceptions. Although the causal link between media reports and market movements remains ambiguous, but insofar as media reports influences behavior, it has the potential to affect economic development. Regardless of the causal question, is there really a difference between how international and local African media covers news about the continent? We test the hypothesis in our report Foresight Africa 2016. If we look at the headlines in 2015 from prominent Western media sources from the United States and the United Kingdom, health, sports, and migration dominate the stories about Africa. Stories on Ebola overshadowed others at the beginning of the year, followed by the rugby and cricket world cups, and then the migrant “crises” toward the latter half of the year. These trends might not seem striking—as of December 2015, the Ebola outbreak has caused over 11,000 deaths; South Africa performed particularly well in the rugby and cricket world cups this year; and there has been increased attention to the roughly 1.5 million migrants that crossed into Europe in 2015 (not just from Africa). What is fascinating about these undoubtedly important stories is that local African print media didn’t pick these headlines as the big events happening on the African subcontinent. 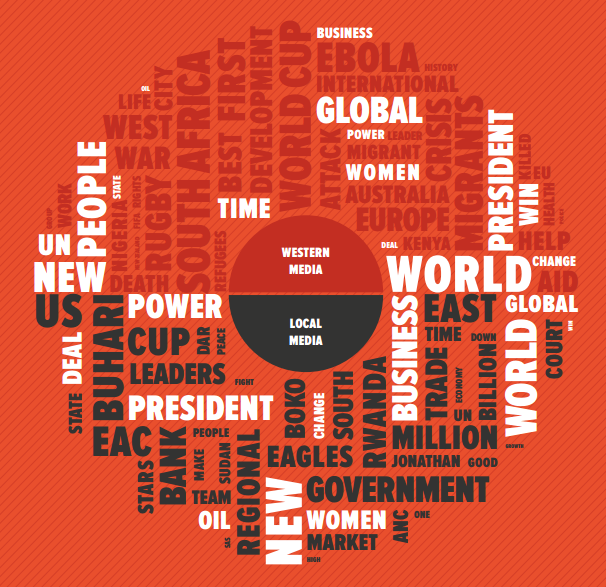 For local media, the Nigerian election, the Burundi crisis, and regional trade topped the list. 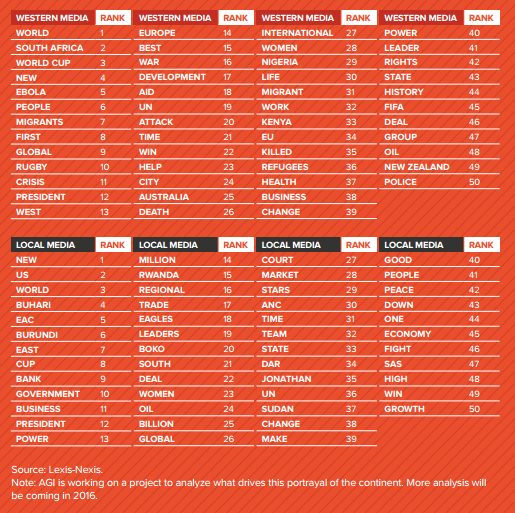 It is for that reason that this year’s Foresight Africa 2016, takes a look at the top 50 keywords found in the headlines of Africa-related articles (i.e., articles with the word “Africa” in the headline or leading paragraph and those geographically indexed to Africa) of 20 major Western and local (African) media sources for the period January-November 2015. The figure below demonstrates the stark differences in their coverage. The top half shows Western media, the bottom half shows African media, while the words in white note the overlap. Only 15 words are prevalent in both. Table 1 ranks the words pictured above. Interestingly, while “business” and “oil” are the only economic/business related words that topped the chart for Western media, local media seemed to focus on similar topics disproportionately more, with “growth,” “trade,” “economy” and “market,” among its top 50 words. As noted above, Western outlets, rather, focus more on the negative, with “death,” “crisis,” “refugees,” and “attack,” much more common. For more on how external reactions, perceptions, and shocks affect African economies, see chapter 1 in Foresight Africa 2016: Managing Economic Shocks: African Prospects in the Evolving External Environment. In the months to come, the AGI team will be providing additional analysis on the African and international news media sentiment. Please stay tuned to Africa in Focus for more updates on this ongoing project. For more information on the methodology and the choice of media sources, please contact the AGI team at agi@brookings.edu.